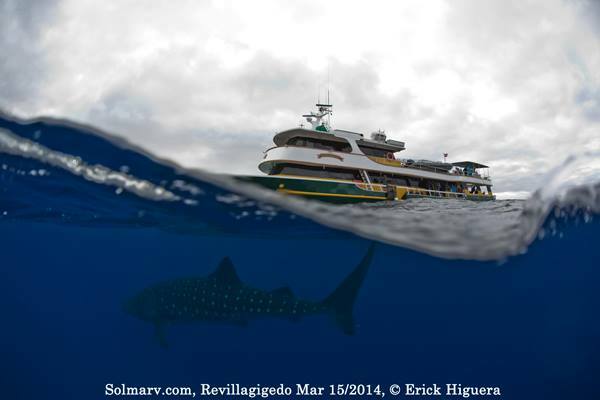 Solmar V is a luxury live-aboard dive vessel departing from Cabo San Lucas, Mexico—well within range of the most exciting diving in the Sea of Cortez and Soccoro Islands. 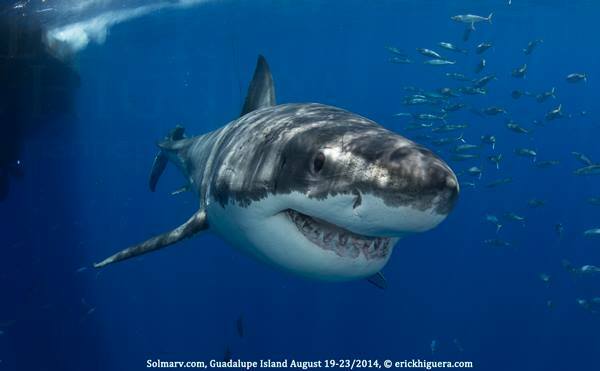 During the weeks of the great white shark season at Guadalupe Island you depart from Ensenada, Mexico. The Solmar V travels with a crew of 10 and a maximum of 22 divers. As a guest, you will receive unmatched service and comfort while experiencing the best big animal diving on earth! Side scanning sonar, multiple radar systems and the most modern electronic marine technology package provide an excellent compliment to the experienced crew. Twin compressors, with cascade storage for fast filling, provide guests with an endless air supply and quick fills between dives. Two main engines and three full-time generators power the Solmar V to a top cruising speed of 11 knots. Two freshwater makers produce 1,600 gallons per day, more than adequate for our passenger capacity. As a guest, you will receive unmatched service and comfort while experiencing the best big animal diving on earth! There are no dormitory-style rooms available on the Solmar V—luxury and comfort are their specialty. The vessel was specifically designed with your comfort in mind. 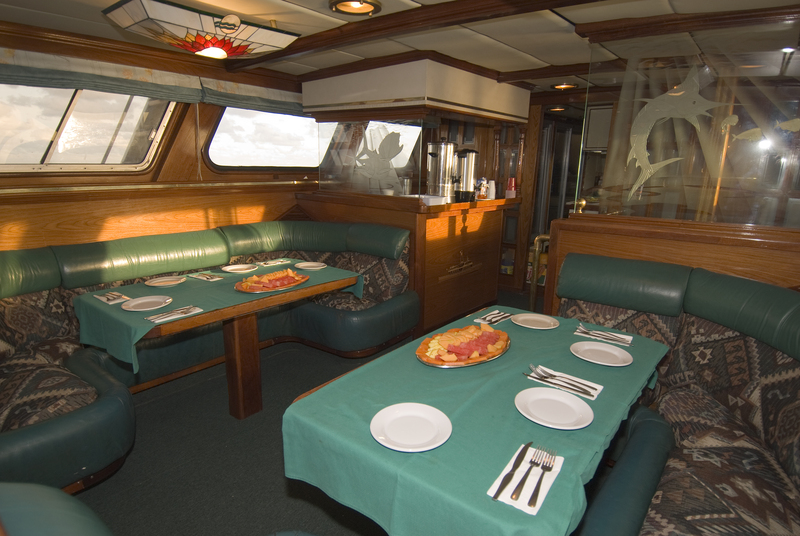 The interior of the Solmar V is outfitted in brass, rich mahogany, granite table tops and is completely carpeted. It is a gracious and beautiful boat. The salon comfortably seats all of the guests and offers a large-screen HDTV, VCR, DVD player and stereo system. You will be well-fed from the time you set foot on board until the time you leave. Arriving guests are greeted with snacks and a welcome Margarita. Each day the early risers can start with fresh, hot coffee or tea. Before the first dive passengers are served their choice of continental or hot breakfast, both if you like. At lunchtime, divers come back to the lounge for a delicious 3-course lunch which includes fresh homemade soup, a hot entree and desert. During the day there is always fresh fruit available, hot chocolate and a never-ending supply of guacamole. They strive to use fresh produce and local ingredients as much as possible. The crew realize that the diving experience is like no where else on earth, so they may opt to keep the dive deck open through lunch on days where the experience is extraordinary. On those days lunch will be available over several hours so you can grab something to eat during your surface interval and get right back into the water when you’re ready. They don’t want you to miss any of the excitement! Following the afternoon dives the Chef will have snacks waiting, which leads to happy hour. There is plenty of Mexican beer and Chilean wine on board and there is no additional charge for either. If you like Tequila be sure to try Pepe’s Margaritas. They are world-class! Every night divers will enjoy a sumptuous 3-course dinner. They serve a house “white” and “red” which most folks like, but if you’ve brought a special bottle or have a special occasion while on board, they’ll provide you with decanters and crystal wine goblets. Each mahogany-detailed stateroom features air conditioning with individual controls, a private head, sink and shower and a TV/DVD player for your enjoyment. 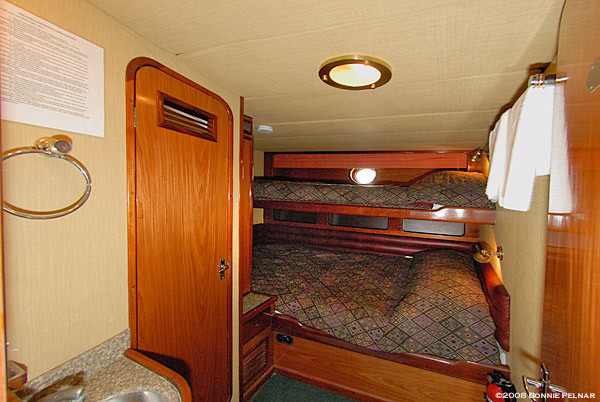 All staterooms have top-of-the-line “Pillow-Top” mattresses and down pillows, and new carpet. When you visit the Sea of Cortez or Socorro diving is sometimes done from the pangas and sometimes from the Solmar V, depending on the dive site and conditions. The Divemasters will let you know the plan when you arrive at each location. For each dive site your Divemasters will give the group a thorough dive briefing and answer any questions you might have before you get into the water. Typically the divers are divided up into two groups, each with their own panga. A simple back roll and you’re enjoying the wonders each destination provides. Your panga driver stays within sight of your bubbles throughout the dive. Each pangas has a sturdy side ladder so you can don your gear in the water and easily climb up after your dive. Guests may also dive directly from the Solmar V. There are entry gates on both sides of the vessel, as well as the custom-built double swim step, which gets rave reviews from all the guests! Getting into and out of the water is very easy. The helpful crew is always there to assist. The dive deck is very spacious and designed for flow and ease of use, even with a full load. The dive stations are positioned around the outside of the dive deck. You don’t need to carry your tanks around at any time during your vacation. The crew will fill your tank between dives and move your gear to or from the panga if needed for the next dive. There is also plenty of room on both sides to hang your wetsuits. 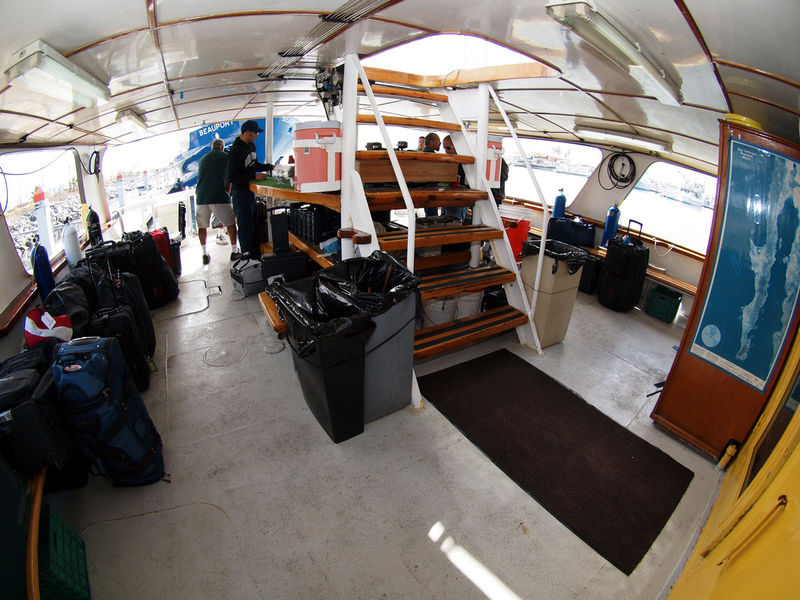 At the center of the dive deck is a huge multi-level camera table, complete with charging stations and an air gun. There are also plenty of charging stations inside the lounge. At the back of the dive deck are four large rinse bins; two for rinsing gear and two separate bins for cameras. There are also two fresh water showers so you can rinse off after getting out of the water. 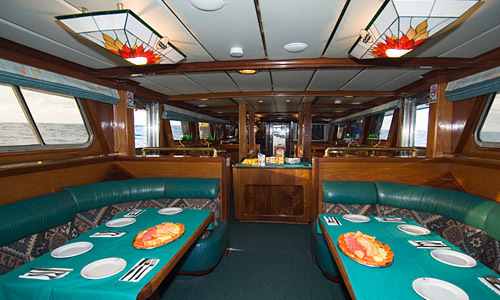 Fluffy towels are provided and fresh drinking water is always available on the dive deck. 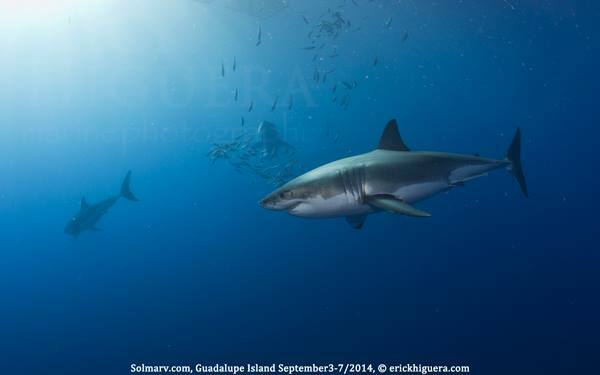 When we visit Guadalupe Island the diving is done in cages, so the routine is different. For these trips we bring three state-of-the-art shark cages; two float at the surface at the back of Solmar V and one is a submersible that sits at about 30′. These trips are limited to only 16 divers so you’ll have plenty of time with the sharks and more room in the cage. The submersible cage gives divers a 360 degree view! Air is supplied from the surface so you don’t need a tank. Diving is done all day, rotating divers every hour. The cage diving at Guadalupe is bar none the greatest on the planet, with up to 100 feet + of visibility. The water temperature ranges from 67 to 70 F degrees making this the ultimate White Shark destination, especially for the discriminating underwater photographer. Departing from Cruiseport Marina in Ensenada, Mexico, this is one of the most exhilarating adventures in Baja California. After 9 seasons of operating at Guadalupe Island the experienced and professional crew provide guests with a safe and secure environment to meet the apex predator of the sea – the great white shark. 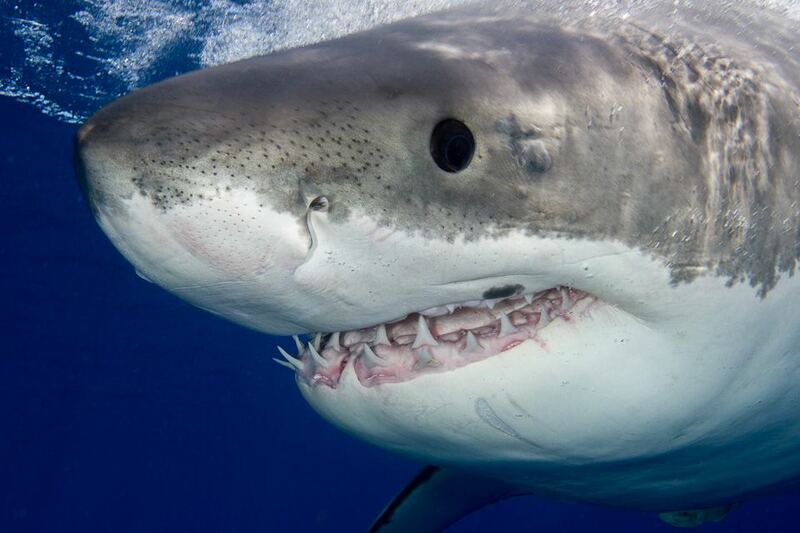 Located in the Pacific Ocean approximately 165 miles west of Ensenada, Mexico, Guadalupe Island is now considered the world’s best location for viewing, photography and video of great white sharks. The visibility is often more than 100’ and the water temperature averages between 65F-70F. This is cage diving at its most exciting and, because you will be using surface supplied air (hookah) instead of scuba tanks, this adventure is open to both divers and non-divers alike. These 5 day trips are shorter than our other diving excursions so they are perfect for a great mini-vacation. 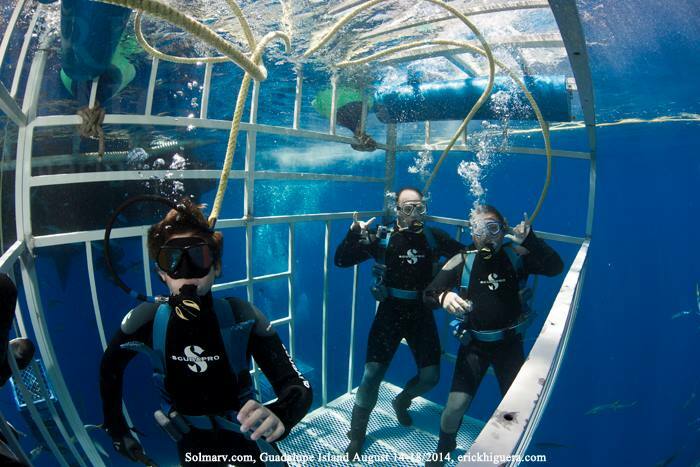 With a total of 20 guests, the Solmar V operate 2 four man cages using a proprietary swivel system which hooks to the swim platform making it very easy and safe to get in and out of the cages even in rough weather. Using two four man surface cages enables the crew to rotate 4 guests in and out of each cage every 45 – 60 minutes all day long giving everyone plenty of time with these incredible creatures. Easy observations from the cages. 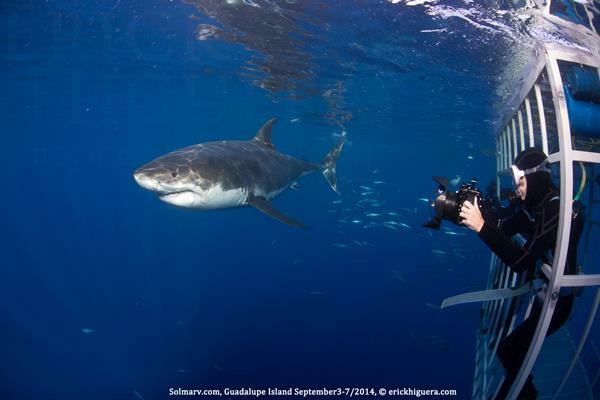 SOLMAR V ALONG WITH GREAT WHITE ADVENTURES PIONEERED THE SUBMERSIBLE CAGE EXPERIENCE AT GUADALUPE. 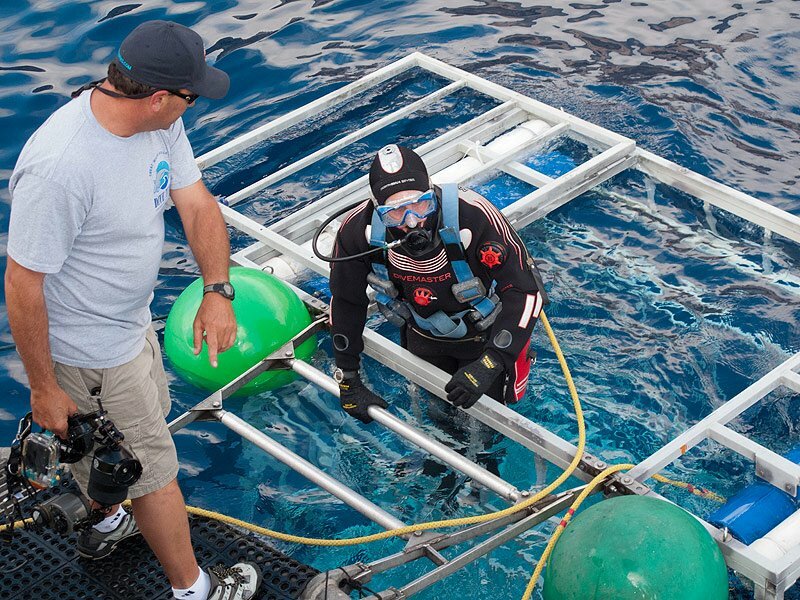 The submersible cage allows them to descend a little further into the realm of the great white shark. Although the submersible cage lowers to only 30′ below the surface of the water, it provides a completely different perspective to your great white shark diving experience. These spectacular dives are available to certified scuba divers only. A safety diver escorts two divers at a time on these 20 minute high energy rides. They rotate all certified divers who wish to experience the submersible cage as many times as ocean conditions will allow. 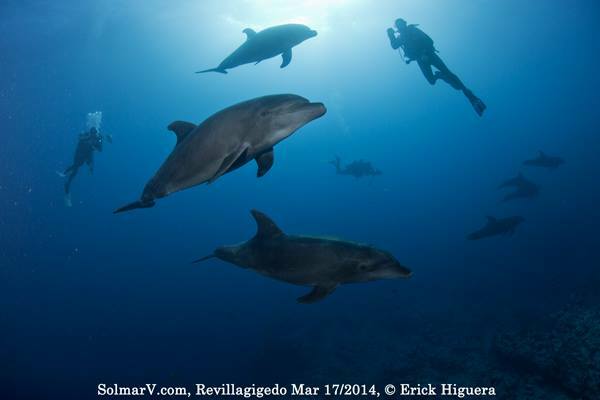 The view offered by the submersible cage is a photographer’s dream come true. You are actually surrounded on all sides by these magnificent creatures in clear blue water. The Solmar V have had an exceptional response from their guests regarding this experience. Both professional and amateur photographers rave about the different angles available to capture the mighty great white sharks of Guadalupe Island. 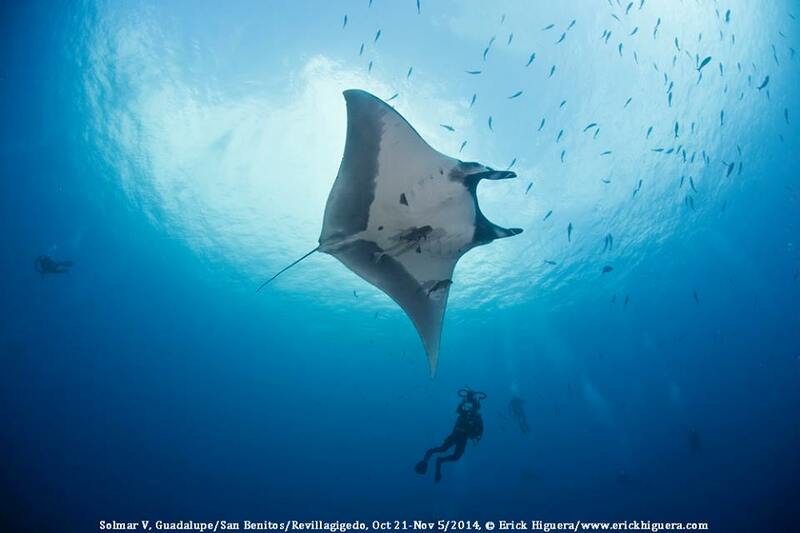 The Revillagigedos Islands consist of 4 islands – San Benedicto Island, Socorro Island, Roca Partida and Clarion. We simply call them Socorro. They are wild, remote and unpredictable and have been called the Mexican Galapagos. This area is famous for up close and personal encounters with the Giant Pacific manta ray, which can grow to 22 feet from wingtip to wingtip. 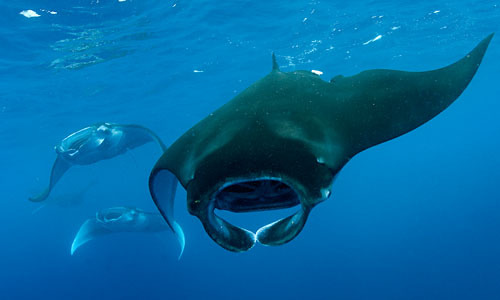 The crew have been interacting with these gentle giants since 1992 and as a result of having worked with several manta researchers over the years, they have extensive ID’s on most of them and special relationships with many of them. 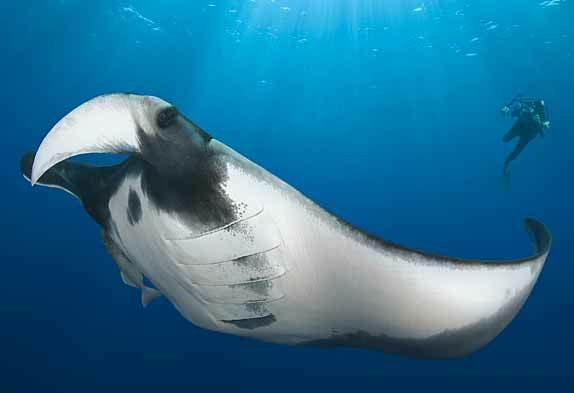 The crew absolutely do not chase or ride the mantas, and they allow their interaction with them to be initiated by the mantas themselves. They believe that their continued willingness to interact with divers is due to the respect they have shown for them over the years. San Benedicto is by far the best location in the world to experience and photograph these gentle giants. The feeling of a wild animal this large deliberately interacting with you is something you will never forget. There are lots of sharks in the Revillagigedos Islands – hammerhead schools, white tips, silver tips, silkies, duskies, Galapagos and occasionally tigers. The crew have encountered up to 7 species of sharks on a single dive! There are several hammerhead cleaning stations that they visit each trip, weather permitting. 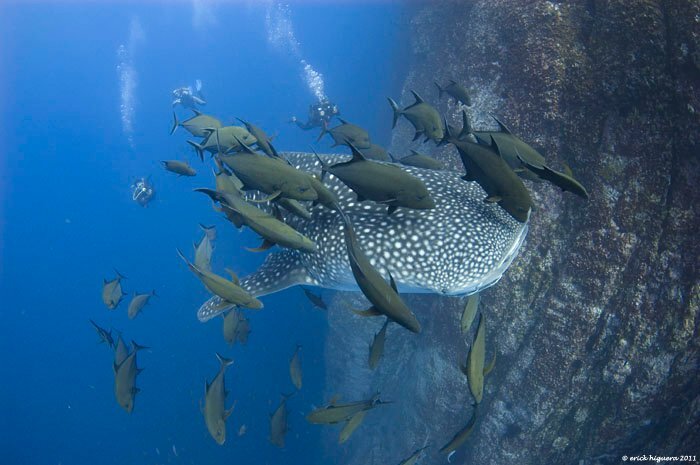 Whale sharks are a special treat at the islands, they find us in November/December and late April/May. They also encounter pods of wild bottlenose dolphin on a regular basis and from January through March, these islands are home to a large population of humpback whales, that come here to breed and calve. The crew have observed several newborn humpbacks in the years they’ve been fortunate enough to visit these remote and pristine islands. 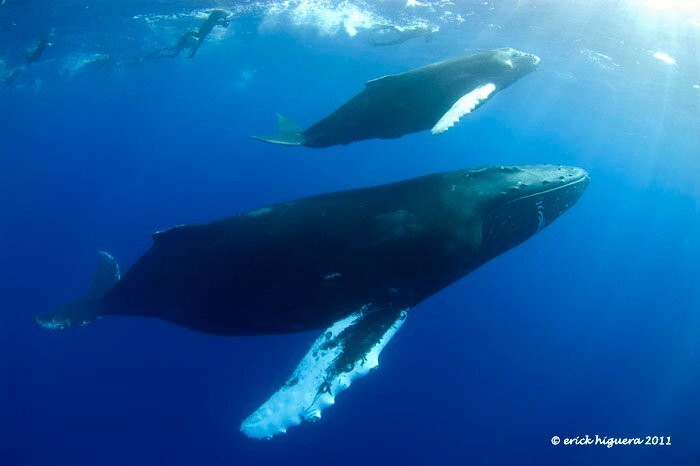 In the last few years the frequency of underwater encounters with humpbacks has increased dramatically. The scientists who visit the Revillagigedos Islands every year to study the migrating whale population tell the crew that after twelve years of encountering the SOLMAR V, the humpbacks now recognize the vessel and so the opportunity for underwater encounters improves. Add to the mix extremely large tuna (the world record yellowfin is from these waters), wahoo, thick schools of jacks and many other big critters along with endemic tropicals found nowhere else in the world, and you have the BEST BIG ANIMAL DIVING ON EARTH!! Each year the Solmar V heads north from Cabo San Lucas into the Sea of Cortez. The Sea of Cortez is also home to many endemic species, such as the Cortez angelfish and Cortez damselfish, found nowhere else in the world. They also encounter whale sharks, hammerheads, orcas, whales and dolphins. The crew have been diving the amazing Sea of Cortez since 1984, when they opened their scuba store, Amigos del Mar in Cabo San Lucas. The Sea of Cortez is located between the Baja Peninsula and the mainland of Mexico. It is one of the youngest and most fertile seas on earth, containing over 850 species of reef fish. The beautiful, tranquil sea has much to offer – large schools of tropicals, jacks, tuna, dorado, wahoo, marlin, stingrays, turtles, playful resident California sea lions, several types of moray eels, lobster, octopus, frogfish, sharks, mantas, and the famous flying mobulas of the Sea of Cortez. Dive the infamous offshore seamounts like El Bajo and Gordo Banks or dive the largest living coral reef on the western side of North America, Cabo Pulmo. The water temp is usually between 74F – 84F during the visits into the Sea of Cortez and the visibility ranges from 50 – 100+ ft. 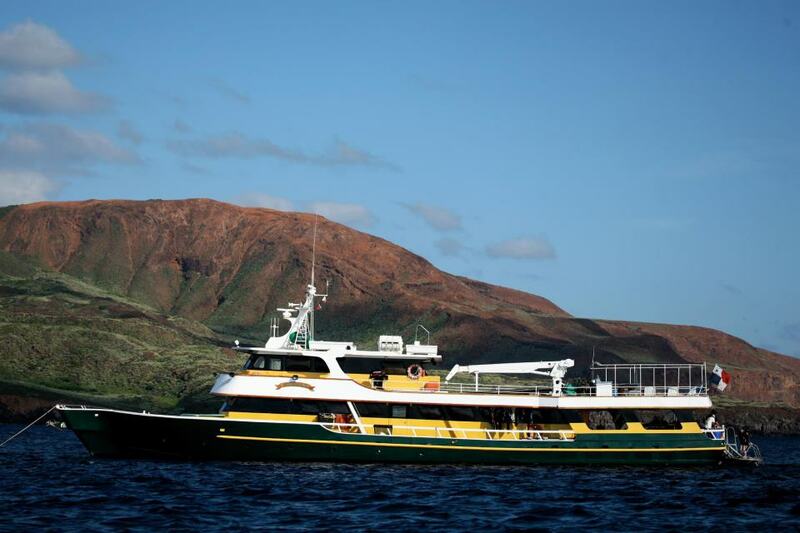 The dates of these trips vary each year but usually run in June, July and October, depending on the dates of their boatyard haul-out and the dates of their spectacular Guadalupe Island great white shark trips. This area is usually calm and the distance between dive destinations is not far. Although there are some advanced dives most of the diving is moderate. This is a great trip for those looking for a live-aboard experience in calm water with both big and small marine animal encounters. There is something special about the Baja peninsula and diving the Sea of Cortez – a living desert wilderness spilling into the spectacular Sea of Cortez.